Refreshing novel about the scary summer before setting off to uni. When Elizabeth receives her first-year roommate assignment at the beginning of summer, she shoots off an email to coordinate the basics: TV, microwave, mini-fridge. She can’t wait to escape her New Jersey beach town – and her mom – and start life afresh in California. The first note to Lauren in San Francisco comes as a surprise; she had requested a single. But if Lauren’s learned anything from being the oldest of six, it’s that you don’t always get what you want, especially when what you want is privacy. Soon the girls are emailing back and forth, sharing secrets even though they’ve never met. With family relationships and childhood friendships strained by change, it suddenly seems that the only people Elizabeth and Lauren can rely on are the complicated boys in their lives… and each other. I’ve got a thing for split narratives at the moment, it seems, and Roomies is a fantastic example of how brilliantly they can work if done well. The structure lends itself perfectly to the clever and unique storyline, which centres around the exchanges between Lauren and Elizabeth in the lead up to becoming roommates at university. They’re apart for 99% of this novel and each have their own stories to tell, so we get to follow both of them individually whilst witnessing their relationship develop from the very first email, and I loved it. Both Lauren and Elizabeth are such wonderful characters. They’re well developed and relatable, flaws and all. I never once got confused between them, which is a real risk with split narratives, and I’m assuming that’s thanks to the contribution of two authors (this is one of the reasons why Lobsters by Lucy Ivison and Tom Ellen worked so well, too). I really enjoyed the contrast between their lives. Elizabeth, or EB as she’s more fondly known, is an only child. Her parents are divorced and she feels quite lonely with such a distant family. Meanwhile, Lauren has a really close-knit family and a super-busy family life. Her family adores her, but she feels like it’s a bit too oppressive with lots of younger siblings that she feels quite responsible for. Despite being so different, Lauren and EB’s stories compliment each other perfectly, and it’s one of those times when you realise that the grass often really is always greener on the other side. I found myself relating to this book a lot more than I expected to. It’s not too long ago that I was spending the summer panicking about starting university and living with a bunch of girls I’ve never met. Not only that, but Roomies brings up a topic that I’ve not read about much in YA fiction and that’s interracial relationships, something very close to my heart because I’m in one! Very briefly, it annoyed me, because the way Lauren and Elizabeth talk about Keyon, who is black, is quite ridiculous. When I actually thought about it, though, I realised that that really is how lots of people still react. If you’ve never been around people of another race, it’s difficult to truly understand that you don’t need to tiptoe around the subject. It’s highly unlikely that you’re about to offend anyone unless you’re outright being intentionally racist, but we all worry about it anyway (even I used to, but after 9 years of having a black second family, I realise how silly it was). So while it seemed ridiculous at first, I quickly realised that it was simply realistic, and actually quite refreshing. It’s honest, authentic, and I really hope to read more about interracial relationships in YA soon. What made it even better was Kenyon’s jokes about his own race, and the jokes that he and Lauren were eventually able to share about it. Talking about race is the first step to understanding that it doesn’t matter, and that inside we are all the same. 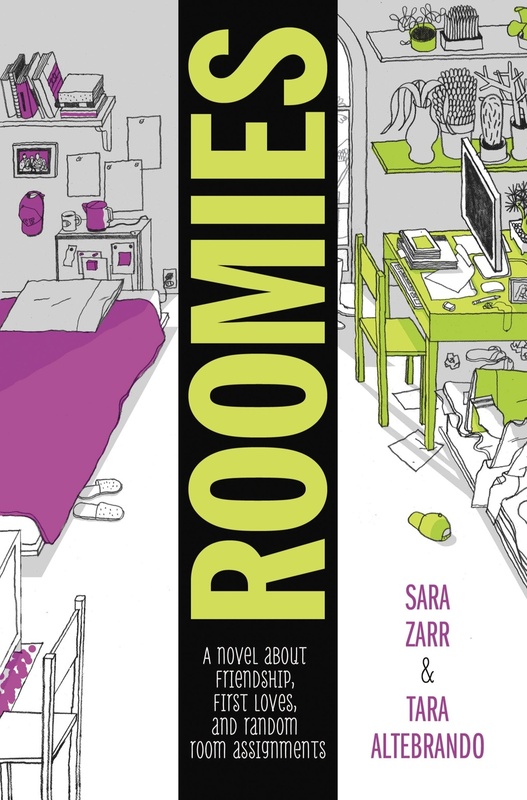 So even though I think some people who don’t fully understand that might find Roomies a bit unsettling, it’s not an untrue account of the subject and it’s absolutely relatable to me, one of the reasons I enjoyed this novel so much. (If you’re interested, I’ve written about my thoughts on interracial relationships here). It’s quite a short read, and the ending is a bit of a cliffhanger that I don’t think we’ll ever get to read more about, leaving me feeling very much like I did at the end of Trouble by Non Pratt, but despite that I’d highly recommend it, particularly if you’re about to go to university yourself.